As expected, Xiaomi on Monday, September 11 launched the much awaited the Mi MIX 2 and Mi Note 3 smartphones in China. As its biggest highlight and one of the most talked features, the Mi Mix 2 sports a 5.99-inch almost a full bezel-less display with an 18:9 aspect ratio which is 12-percent smaller bottom bezel than the previous generation Mi MIX, it also packs a hidden sound-guided speaker as well as an ultrasonic proximity sensor. The new Xiaomi Mi Mix 2 sports 5.99-inch almost a full bezel-less display which is 11.9 percent smaller in the body compared to the 6.4-inch Xiaomi Mi Mix, it is now 2.5 percent thinner, and 11.5 percent lighter. The regular edition of the smartphone will be available in a Black colour variant, which also features a Black lens coating for the front and rear camera, apart from an 18K gold plated camera ring on the rear camera. It features a frame built out of 7-Series aluminium, holding in the four-sided curved ceramic body. There is a Special Edition which you can see below features a complete ceramic body, and will be available in both Black and White colour variants. Another big highlight of the Mi Mix 2 is the ‘hidden sound-guided speaker‘, which according to the company is a ‘cantilever piezoelectric ceramic acoustic technology’ that resonates the sound through the metal frame and delivers it through the screen itself – completely hiding the speaker on the smartphone. This is achieved with 50mW membrane speaker, sound guiding tube, and a sound hole. The smartphone also supports 6 modes and 43 bands – making it a ‘global LTE smartphone’. 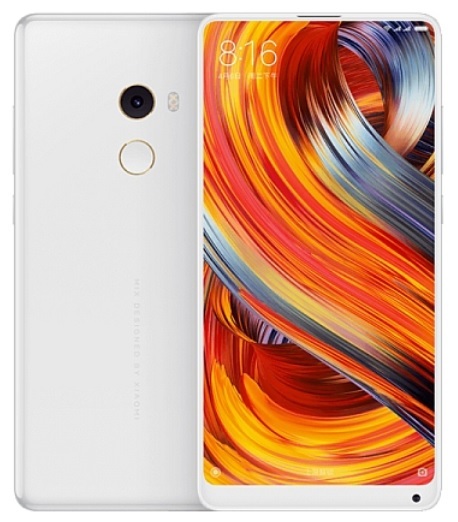 It comes with dual-SIM (Nano-SIM) Xiaomi Mi MIX 2 features a 5.99-inch FHD (1080×2160 pixels) 18:9 display with a pixel density of 403ppi and a DCI-P3 colour gamut. It is powered by a Snapdragon 835 SoC clocked at up to 2.45GHz and paired with 6GB of RAM the special edition comes with 8GB RAM. It sports a 12-megapixel Sony IMX386 sensor with 1.25-micron pixels, 4-axis optical image stabilization, 5-piece lens, a f/2.0 aperture, and facial recognition. On the front, it sports a 5-megapixel front camera with a facial recognition function. As for storage, there are three fixed in-built storage variants, namely – 64GB, 128GB, and 256GB. Connectivity options include 4G LTE, dual-band (2.4GHz and 5GHz) Wi-Fi 802.11ac, GPS/ A-GPS, Bluetooth v5.0, and USB Type-C. The regular variant of the Xiaomi Mi MIX 2 measures 151.8×75.5×7.7mm, and weighs 185 grams. 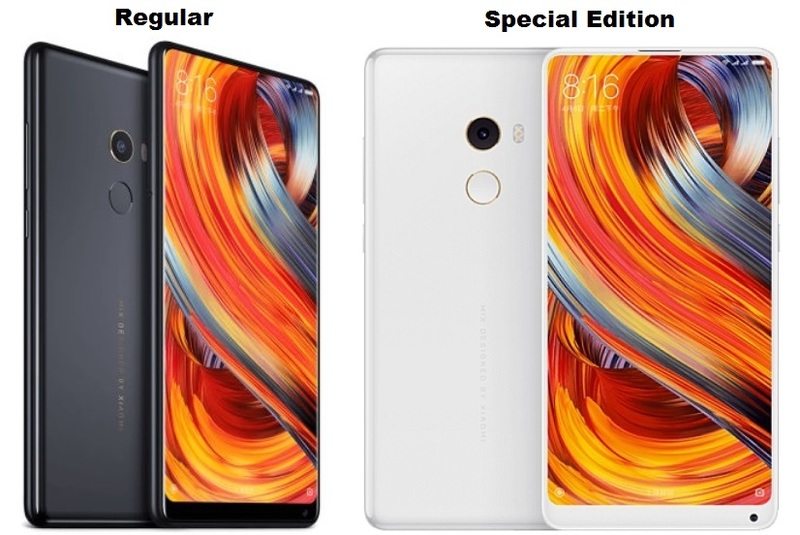 The Xiaomi Mi MIX 2 Special Edition on the other hand measures 150.5×74.6×7.7mm and weighs 187 grams. Both variants are powered by a 3400mAh battery. Sensors on board include accelerometer, ambient light sensor, barometer, digital compass, gyroscope, and ultrasonic proximity sensor. Xiaomi Mi MIX 2 has been priced at CNY 3,299 (roughly Rs. 32,300) for its 6GB RAM/ 64GB storage variant, CNY 3,599 (roughly Rs. 35,300) for the 6GB RAM/ 128GB storage variant, and CNY 3,999 (roughly Rs. 39,200) for the 6GB RAM/ 256GB storage variant. There’s also a Xiaomi Mi MIX 2 Special Edition, with a full ceramic body, priced at CNY 4,699 (roughly Rs. 46,000) – it features 8GB of RAM and 128GB of storage. 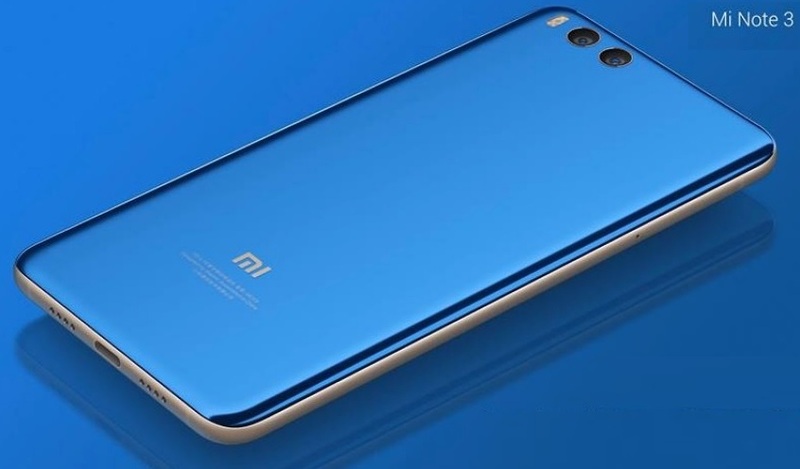 Alongside the Mi Mix 2, Xiaomi has also launched Mi Note 3, Mi Note 3 sports a 5.5-inch full-HD (1080×1920 pixels) display with a pixel density of 403ppi. The Mi Note 3 is powered by a Snapdragon 660 SoC clocked at up to 2.2GHz and packs 6 GB of RAM and will be available with 64GB and 128GB storage variant. The Mi Note 3 packs quite similar specs to the Mi 5X, and sports dual-camera setup on the back, a regular and a 2x telephoto one. The rear camera also features portrait mode. Mi Note 3 sports a 16mp front camera with Adaptable AI Beautify which smooths skin and can even change the shape of a face. The Xiaomi Mi Note 3 packs a 3,500mAh battery with Quick Charge 3.0. The Mi Note 3 will be available with different pricing based on their storage – 6GB + 64GB in Black costs RMB 2,499 (Rs. 24,559), 6GB + 128GB in Black is RMB 2,899 (Rs. 28,390) and for RMB 2,999 you get the Blue 6GB + 128GB Mi Note 3 (Rs. 29164).